Moving along on the Of a Summer's Day quilt. Progress has been slow since being seduced by a spinning wheel, but there's progress nevertheless. 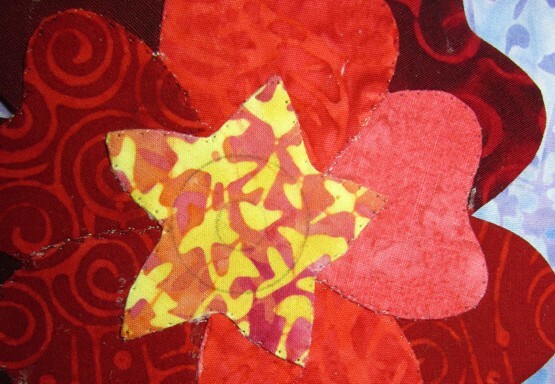 Deciding how to embellish the appliques is a bit of a challenge to me. I'm not really big on glitz and glamour, but a well placed bead is a thing of beauty. I started by leafing through an old picture book of rose botanicals, looking for just the right center treatment for my old fashion roses. Once I found the look I was after, I marked the centers with concentric circles. (A circle template from an office supply or drafting store is a marvelous thing.) The size and placement were done totally by gosh and by golly. I did make a small attempt to center the middle circle, but there was no measuring involved. The circles also varied from flower to flower. 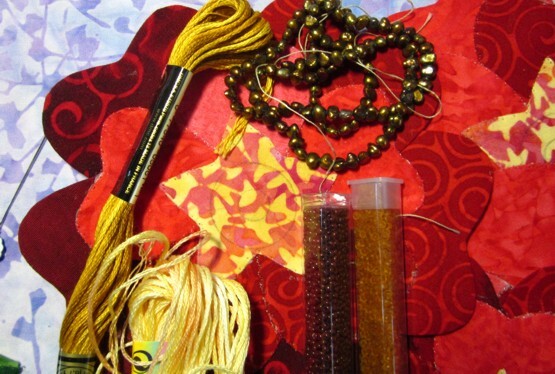 I gathered up the tools for embellishing and set to work. 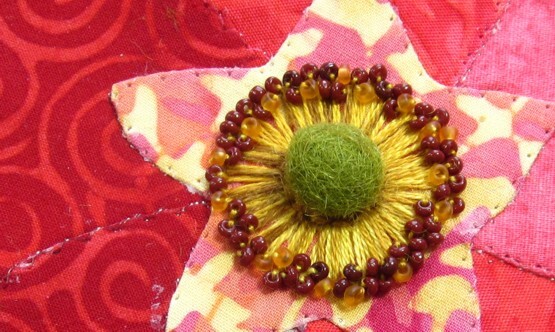 Starting with straight stitches from the center to the outer ring, I used the darker variegated thread to create the stamens. I rustled up a strip of wool I had cut and stashed in my aborted stab at rug making, to create the centers. It sat at that stage (and of course, I didn't take a picture) for several days while I wrestled with the decision between french knots and beads. 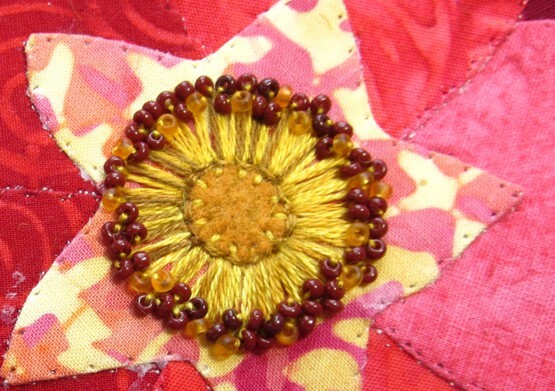 I had already done french knots on the tiny yellow flowers, so adding them to the roses felt a little redundant. 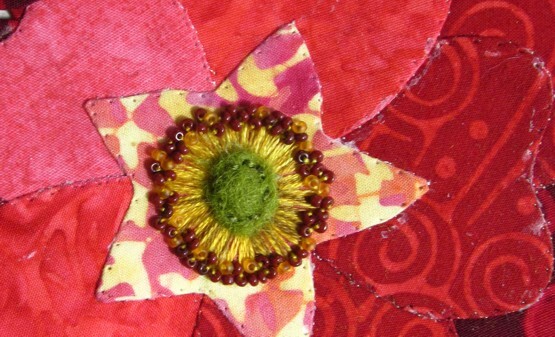 I worried that beads would have too much dimension and take away from the applique. In the end I realized that delica beads would be no bigger than french knots and got to work. But now the centers still seemed to be missing something. More dimension maybe? Maybe I could use the yarn again, as I did in the basket, and stitch in a little trapunto under the wool centers. 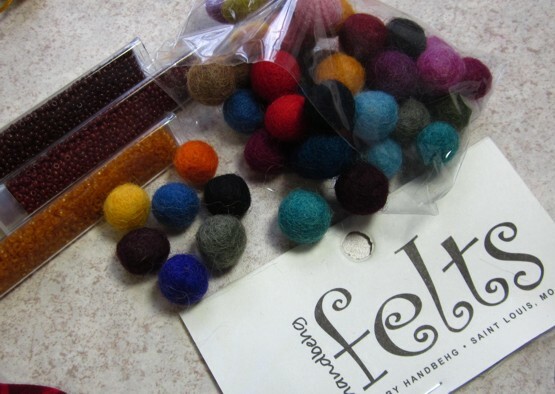 I don't know why this little bag of felt balls was lying out on my table, but there it was. Hmmm. First I had to work through the thought that it wasn't okay to cut these little gems into smaller curves. Perhaps there are felt ball police who make rules about these things. It could happen! But I got over that. There you go, now we're talking. The little burst of green in the center of all that red, perfect! Next I had to decide how to attach it. I could use a permanent fiber glue, which would preserve the roundedness of the center, but I just couldn't bring myself to glue something to a quilt. I know other people do it, but it's just not really for me. Besides, the bubble of felt looked too fake to me. Next step is to add veins to the petals. I've used two strands of a six strand floss, and I'm not sure if I like it. The lines feel a little too pronounced. I may try a single strand, or I may add the veins when quilting, or, I might just keep going as is. These things must be done del.i.cate.ly, my pretties! I've been bitten, bitten hard. Everyone needs a hobby, right? 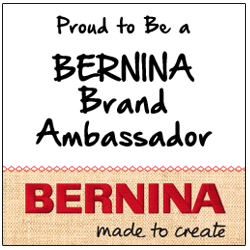 When my quilting hobby became my job, I needed to find something new to do, just so I wasn't working all the time. I've been a fiber maniac my whole life. From four on, when my grandmother taught me how to embroider, I have spent my entire life either playing with fiber or figuring out how to get more fiber. One thing I had never done was spin wool into yarn. 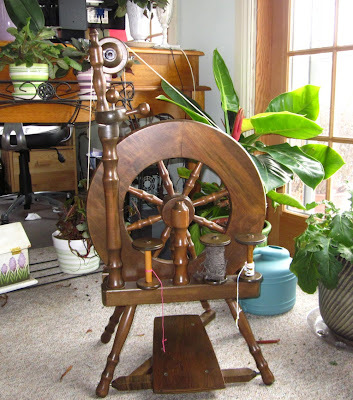 In my down time I've been hanging out at Twisted Warps and Skeins, playing with their assortment of spinning wheels.There are so many factors to consider before choosing a wheel. Just as in quilting, spinning has a vocabulary of its own. While Pam and Dale tried to convince me to take my time before making a purchase, I just knew that I needed to have a wheel at home to be able to practice in a quiet space. They had me spend some time on this used wheel, an Ashford Traveller, then offered it to me at an awesome price, and it became mine. 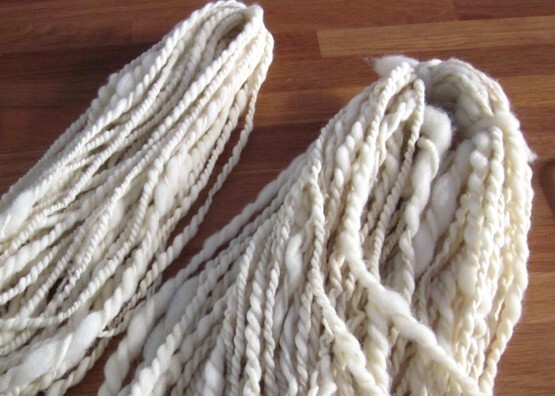 This is the first yarn that I spun. It's pretty much a disaster. Too thick in some spots and too thin in others, and over twisted throughout. I was just going to dump it, it's a small expense, just about the cost of a yard of fabric, and I figured I'd learned everything I needed to learn out of that fiber. But no, Dale said I had to take it home. So I turned it into "art yarn". I've finally found a use for the crock pot that the men in the family despised. 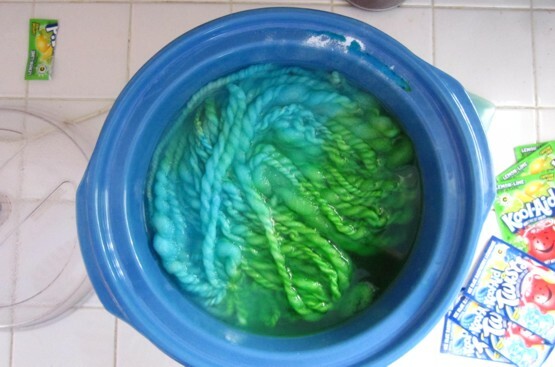 Several packs of Kool Aid, and a soak in the pot for a bit, and now I've dyed my first yarn. It's just crazy yarn, and I'm thinking I'll knit it up with ginormous needles and then felt it, perhaps into a seat cover for my desk chair. Or, something cozy to toss into Gracie's crate. Learning something entirely new has been good for my soul. It has reminded me of how lost one can be when learning a new process, how terms that are second nature to us can be mysterious and confusing to beginners. It's given me something to be bad at, and yet enjoy the process of getting better. As I always say, anything worth doing is worth doing badly for as long as it takes.